The exquisitely-voiced, softly-spoken Ray Lamontagne has just announced two UK dates this September, including the prestigious Royal Albert Hall in Kensington. 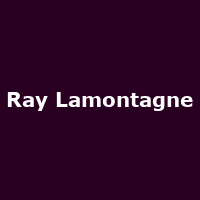 This will be Mr Lamontagne's third appearance at the venue (the first two being back in November 2007) - and what better venue for his mellow, acoustic guitar-driven vibe? Ray finished a thirteen date February UK tour just a month-and-a-half back, and it shows the thirst for his music, that he is already announcing some September dates. The UK tour starts in Newcastle's City Hall on 9th September, taking in Wolverhampton's Civic Hall, Sheffield, Manchester, Portsmouth and culminating in a date at the Royal Albert Hall on 16th September. Supporting Ray again on his September tour is singer/ songwriter Priscilla Ahn, who was the support act for his recent European/ UK tour - so turn up to hear the support act - she is great! Tickets go on sale this Friday (3rd April) at 10AM.